The Wild doesn’t have a trade-deadline acquisition to debut Tuesday, but it will roll out a different lineup than the one that’s been used recently. 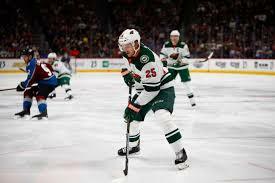 Defenseman Jonas Brodin is ready to return against the Blues after missing the previous nine games to recover from surgery to fix his fractured left hand. Forward Luke Kunin was also recalled from Iowa, along with defenseman Nick Seeler (although Seeler's "demotion" Monday was a paper move). “I’ve been out for a while, so I’m really excited for tonight and to start playing again,” Brodin said. Brodin was injured Feb. 6 when the Wild visited the Blues, getting jammed up along the boards. Immediately, he knew he was hurt but he actually thought it was wrist that was in trouble and not his hand. During the nine games he was out, the Wild went 6-1-2 – a solid showing that included steady play by the blue line. While Brodin healed up, defenseman Nick Seeler debuted and he’s poised to remain in the mix after the team traded Mike Reilly to the Canadiens Monday ahead of the deadline. The Wild held an optional skate Tuesday, so it’s unclear where Brodin could slot in the top-six against the Blues. Regardless, though, having him back on the ice is certainly a boost for the Wild. 7-1-2: The Wild’s record over its last 10 games. 48: Points on home ice for the Wild, which is tied for second in the NHL. 4: Goals for center Eric Staal in his last four games. 1-1-1: The Blues’ record against the Wild this season. 14: Points for Blues winger Alexander Steen in his last 14 games against the Wild. The Blues are sputtering, mired in a season-high six-game losing streak. This slide has dropped the team out of a playoff spot, as it sits a point out of the second wild-card berth in the Western Conference. St. Louis has been shut out its last two games and hasn’t scored in 140:24. Overall, the team has been outscored 21-7 during its losing streak. Amid these struggles, the Blues traded away center Paul Stastny to the Jets Monday ahead of the trade deadline.